1. Create a new project called “CIS247B_WK2_Lab_LASTNAME”. 2. Using the provided Class Diagram from Step 1, code the Employee class in the new project (i.e., “Realize the UML Class diagrams”). 5. Create a second Employee object using the multi-argument constructor, setting each of the attributes with appropriate valid values. 6. 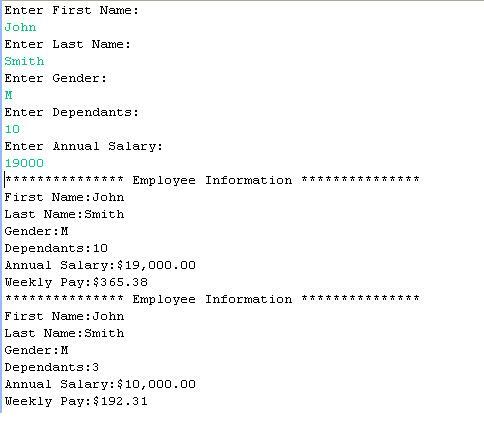 Using your code from last week, display a divider that contains the string “Employee Information”. 7. 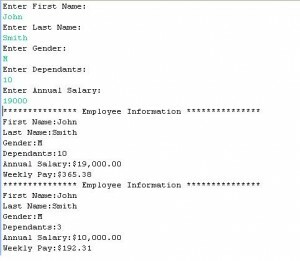 Display the Employee information for the second Employee object. Submit your lab to the Dropbox located on the silver tab at the top of this page. For instructions on how to use the Dropbox, read theseStep-by-Step Instructionsor watch thisDropbox Tutorial. Hi I purchased you lab 1 for this course. I only had to submit the .java and .class files. Do you have both files with this lab also? Can i run your code in Eclipse IDE?